Seal Methods Inc. has been manufacturing High-Performance Aftermarket engine and drives train gaskets since 1974! Gaskets and seals for the Automotive, Motorcycle, Diesel, and Marine markets are at the heart of our business, and we remain a leader in the manufacturing, private labeling, and kitting of these components that are built to our customers’ requirements and able to stand up to the punishing high temperature environments these applications face. SMI has maintained our position on the forefront of automotive gasket design, attachment, and sealing technologies for decades. By combining ideal materials with optimum efficiency manufacturing processes, we can provide the best performing gasket solution for every aspect of vehicle operation and assembly. Our parts can be found on retail shelves, or in part of an assembly used in high-performance applications. From engine builders to component manufacturers to retail distributors, Seal Methods delivers excellence in automotive gasket manufacturing across the spectrum, wherever high-temperature gaskets are required. As an industry-leading solutions provider with a global customer base, we offer the highest degree of product quality and integrity. Our technical sales team and experienced staff are committed to providing an unmatched level of customer support to exceed our customers’ expectations for both direct-to-client and private label manufacturing. And as high-performance automotive enthusiasts, rest assured that SMI is at the forefront of innovative materials and applications for this market! We offer end to end services, including a private label with your brand, packaged and ready for retail sales, and knitting to your specification. High-performance marine vehicles depend on careful engineering and the most robust materials to withstand everything the marine environment can dish out. Let SMI experts help specify the materials to help you keep oil, water, fuel and exhaust gasses where they belong with quality marine engine gaskets and seals. Seal Methods thrives on delivering optimal products that keep the high-performance aftermarket industry running smoothly. We also offer rapid prototyping and expert-level materials specification and testing for even the most demanding applications. Our team loves a challenge. Put us to the test today. 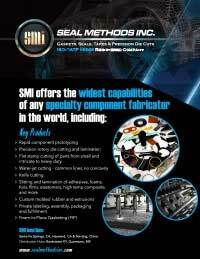 SMI: Your source for seals, tapes, die cuts and custom components for the High-Performance Aftermarket Industry.